This year we got communications from various parts of Venezuela asking us for our help. We will provide humanitarian aid to a poor community close to Maracay by providing food and hygiene products for 200 malnourish children. Another commitment we have is with Children Cancer patients. These children with cancer in Maracaibo that are waiting for our dontaion of diapers, hygiene products and toys before the year ends. We want to cover the operating costs of the delivery to Maracay and Maracaibo and for that we count on you to help 200 malnourish children, 40 elderly, 125 cancer patients in Venezuela. We are a 501(c)(3) non-profit organization in the State of Oregon. Our organization is called Venezuela's Voice in Oregon. We are a group of volunteers that gathers to create positive change in our community and beyond. We focus our efforts on Culture, Education and Humanitarian Aid. We will use your donation in order to be able to pay the expense of delivering humanitarian aid to Venezuela throughout the year. We have been sending donations every 3 months but now we need your help to continue to help pay for the delivery. Elderly Centers in Venezuela has been in communication with us especially Casa Hogar San José in Caracas. This center is run by nuns of the "Congregation of the Desperate and Abandoned" has the center very clean and take care of the elderly very well. However, it has been very hard to find food and hygiene products for all the elderly residents. Their capacity is 120 elderly residents. The nun "Madre Olivia" wrote me the other day telling me that they have been finding many elderly abandonded in the streets. They have been taking them into the Center. Now they have in the center164 elderly residents. It is very difficult to manage all the needs of all of them. Most of them are arriving at the Center with nutritional disorders, dehidration and low in weight, besides the emotional trauma they are expericing by the abandontment. We can help all of them by collecting items here and with your support we can pay the delivery door to door, making the delivery of products directly to the hands of each resident. Non of them are in a health condition to go out and look for food and medications. You can make this happen for them. We as an organization depend on donations to accomplish our mission of providing Humanitarian Aid to people in need in Venezuela. We recieve donations of items like medical supplies, hygienic supplies, and food that is then sent to Venezuela, specifically to Nursing homes, Children's Hospital, and other Hospitals. So far we have paid the delivery to Nursing homes and hospitals in need, but we can't continue doing it without your help and support. The unstable situation in the country of Venezuela has resulted in leaving those most vulnerable in every society (Elderly and Children) to be set aside. The current country landscape shows long lines of people buying any food, as well as any hygienic items and medical supplies that they can find (since right now there is a shortage on everything). Venezuela has been an oil dependant country and with the prices of oil so low, the people in this country have been left in desperate need. We contact each center (and in many cases they contact us first) and they send us their list of needs. Once we have gathered objects from their list and they have recieved the items, they send us pictures of the donations received and a formal letter of gratitute signed by the Director of their organization. Delivery expenses are very high. Usually it depends on volume and weight of each box that we deliver and the price varies each time (depending on the characteristics of the boxes we send) from $200 -$700. But that's only from Portland, Oregon to Miami, Florida. Then from Miami to Venezuela is around $125- $400. At the end, the total price can go to up to $1,000 or more only for sending donations. Your donation will help in paying the cost of the delivery. These centers for the elderly, children's hospital and communities in need will benefit from your donation. We need your help now more than ever. We are working directly with every Nursing home, hospital and community mentioned from our list above. The sooner we can reach our goal the sooner we can send our donations to each of these centers. We believe that with your support all of us can be helping people in need in Venezuela. We believe with your support all of us are making a difference. Let's help together to people that have no means and no voice. Thank you so much! We are raising funds for malnourished children and child cancer patients in Venezuela. Thank you so much for your generosity! Today is #GivingTuesday a global movement to give back. Thanks so much for your support! The organization Mi Pequeño Angel that helps the children cancer patients ask us for help this year again. We want to deliver all donations to them and to accomplish that we need your support. Thank you if you have donated in the past and thank you if you are donating now. Cancer patients in Maracaibo, Venezuela needs our help to bring them a smile to their face as well a small rural community in Maracay, Venezuela where 200 malnourished children are waiting from our help to survive. Donations are going to be sent to Maracay and Maracaibo before the end of the year and with your support these donations can be delivered on time. You may know by now that we are all volunteers that take care of children in need in Venezuela. So, a big Thank you for your support! As you know the situation in Venezuela is getting worse; people are dying of hunger, lots of children with malnutrition, elderly had been losing more than 25kg, the scarcity of food and lack of medical supplies represents the humanitarian crisis that this country is experiencing. We keep receiving donations of medical supplies and food but need your help to send these. Please donate so we can deliver more to reach out to people in need in Venezuela. Thank you so much! In November and December, we have collected many items to donate to Fundación Pequeño Angel in Zulia, Venezuela for children in Hospital suffering cancer and hunger. We also got a donation of food items that will be sent to Maracay, Venezuela for Community Outreach Acofim for families and children suffering malnutrition. We got another donation of medical supplies to be send to Children's Hospital San Juan de Dios in Caracas, Venezuela to help ease the suffering of the Venezuelan families and children. People in Venezuela are desperate for food and medicine; especially children and the elderly. The recent collapse of the power grid in the country means the situation is now catastrophic. 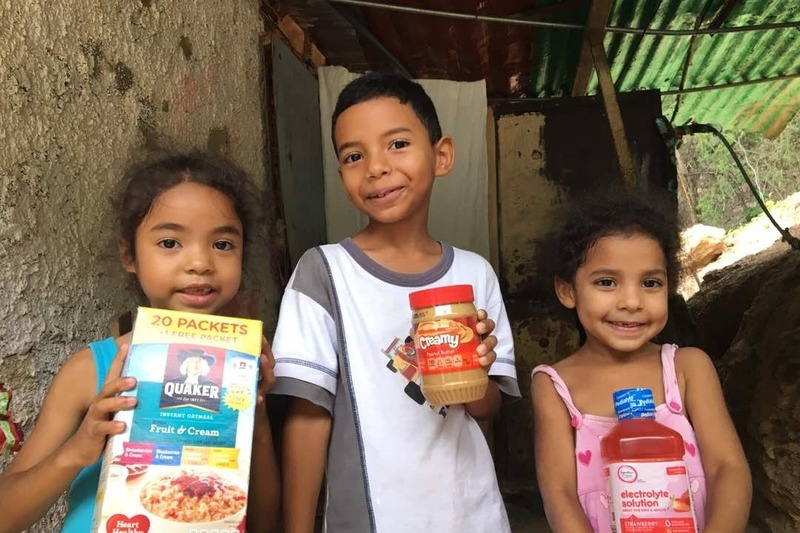 Venezuela's Voice in Oregon is a tax deductible certified charitable organization rushing food and supplies to those in need. Please make a contribution to help our neighbors in Venezuela.